Spacious four bedroom end terrace period family home situated in the popular central location of Peverell within close proximity to Central Park, Plymouth City centre and access to the A38. The property is well presented throughout and offers generous living accommodation comprising, lounge with feature wood burner, dining room, modern fitted kitchen/breakfast room & utility/downstairs w.c to the ground floor and four sizable bedrooms and modern fitted bathroom to the first floor. 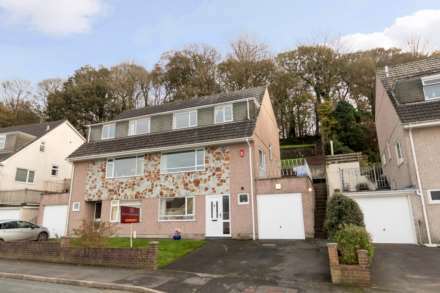 The property also benefits from a rear courtyard, double glazing, gas central heating with newly fitted boiler and has recently been externally rendered. The property is offered to the market with no onward chain. Spacious lounge with fitted wood burner stove and decorative surround. Feature box window to front aspect, picture rail, coving. Space for large dining room table and chairs, window to rear aspect over looking rear courtyard, picture rail. Window to side aspect. Low flush w.c. Worktop. Space and plumbing for washing machine and tumble dryer. Generous double bedroom with window to rear aspect. Coving. Spacious double bedroom dual aspect window to the front and side. Feature box window to the front aspect. Double bedroom with window to rear aspect. Coving. Built in storage cupboard. Good size bedroom with window to front aspect. Enclosed rear courtyard garden with gated access to side of property.